3-Year-Old Faces Her Instructor And Wins The Hearts Of The Internet! What do you get when you have a 3-year-old girl who is passionate about mastering the art of Taekwondo? You have a video which has been viewed over ten million times! 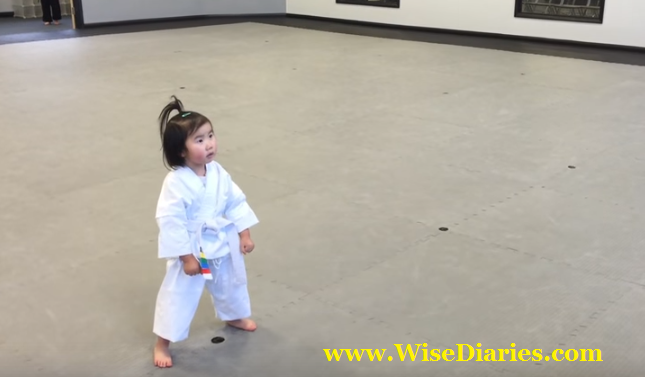 Everyone around the world is blown away at this toddler’s taekwondo demonstration. She has completely won over the internet!Her name is Sophie and she is a student at Premier Martial Arts. It’s a dojo which teaches it’s students the value of patience, respect, self-control and integrity, while of course learning valuable self defense strategies. While it is incredibly cute to watch Sophie perform her art, the benefits it has on young children can be immense. Many comments to this video relayed just that as they talked about how taekwondo has led to better manners and more discipline. Of course taekwondo can benefit kids of all ages, and adults as well. There are many other martial arts practices out there as well (jiujistsu, aikido, etc.) which also teach the same values of mixing patience and control with self defense skills, as well as providing excellent workouts for you body. Watch this wonderful video of little Sophie going through her training. Maybe it will inspire you to take up a martial art and start training yourself or for your kids!